The U.S. Federal Bureau of Investigations (FBI), the U.S. Embassy’s International Narcotics and Law Enforcement Affairs Section (INL), and the U.S. Department of State’s Antiterrorism and Assistance (ATA) Program teamed up to provide twenty-seven Royal Bahamas Police Force (RBPF) officers advanced training in Special Weapons and Tactics (SWAT) August 24-29 in Nassau. The week-long program was led by supervisory special agents from the FBI’s SWAT Operations Unit, which provides training, research, operational assistance, and program management to FBI SWAT teams and international law enforcement partners. Last year, the Special Operations Unit provided over 2,600 hours of instruction and deployed 29 times. In addition to classroom instruction, the RBPF participants received hands-on training including: scenario walk-throughs, firearms training, practical problem-solving exercises, and skill-building drills. Coursework also covered techniques/approaches for tactical situations to enhance the knowledge and capabilities of the RBPF SWAT and Drug Enforcement Unit participants. Moreover, the FBI SWAT instructors emphasized the importance of teamwork in SWAT operations. The practical exercises enhanced team proficiency, confidence, and trust among the team members. The FBI, ATA, INL, and RBPF collaboration will further enable SWAT officers to address potential crises confidently, safely, and professionally. Funding for the SWAT course was provided under the Caribbean Basin Security Initiative (CBSI), a regional security partnership between the United States and the nations of the Caribbean to combat the drug trade and other transnational crimes that threaten regional security. 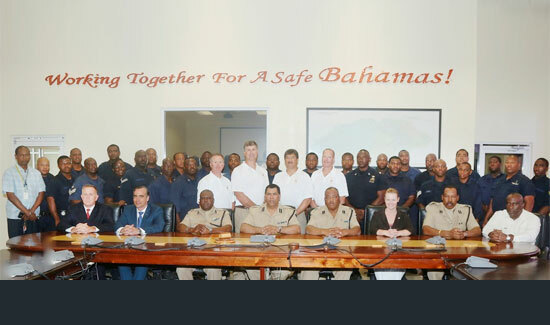 Photo 1: Commissioner of the Royal Bahamas Police Force Ellison Greenslade with U.S. and Bahamian law enforcement officials and training participants at the RBPF headquarters.